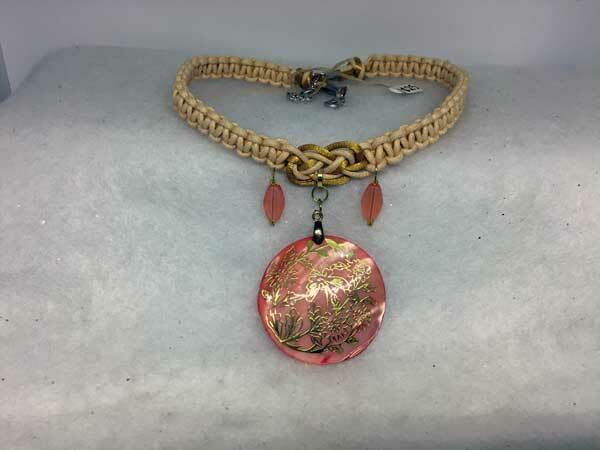 This piece is made with ivory waxed cord in combination with gold satinique cord. The length can vary from about 16 to over 19 inches with a center jeweled piece that adds almost 3 inches. The beautiful pendant is a large, round mother-of-pearl shell in different shades of coral. It has been overlain with an interesting gold, flower pattern. To compliment the gorgeous pendant, and to bring in more coral, I've added two frosted acrylics, surrounded by gold seed beads.